These easy tie front bottoms work great in sheer fabrics as beach cover ups or in silky types for a night out. 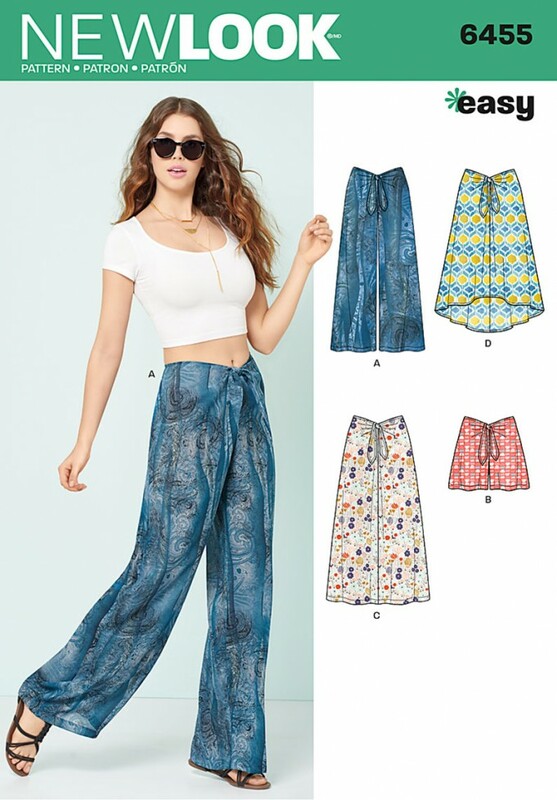 Pattern includes pants, shorts, maxi skirt and high low midi skirt. New Look sewing pattern. Before selecting your pattern size from the Standard Body Measurement Chart (left), please read the following on how to correctly measure yourself. Only basic body measurements are needed to determine your pattern type and size. Remember to wear proper undergarments and shoes when measuring. Also, make sure the tape measure is held snugly and firmly (not tightly) against your body and is always parallel to the floor for circumference measurements. BUST: Measure straight across the back over the fullest part of the bust. HIGH BUST: Measure across the back, high up under the arm and across top of bust. Deduct HIGH BUST measurement from BUST measurement for the difference. Using the DIFFERENCE measurement, find your cup size on the chart below. Take the same measurements as above, except eliminate Chest measurement. Compare your height and body measurements to the measurement charts to select your size category. For Dresses, Blouses, Tops, Vests, Jackets, and Coats, select size to correspond with your Bust/Chest measurement. Adjust the Waist and/or Hip, if necessary. If there is more than 2"(5cm) difference between your Bust and Chest measurement, select pattern size by your chest measurement, because you will achieve a better fit through your shoulders, chest and upper back; adjust the Bust if necessary. For Skirts, Pants, Shorts, and Culottes, select size to correspond with your Waist measurement. Adjust the Hip, if necessary. If your Hips are much larger than your Waist, select the size closest to your Hip measurement and adjust the Waist. When purchasing a pattern that includes a Blouse, Jacket, Skirt and/or Pants, select size by your Bust/Chest measurement and adjust the Waist and/or Hips if necessary. If your measurements fall between two sizes, consider your bone structure. If you are thin and small-boned, choose the smaller of the two sizes. If you are larger boned, choose the larger size. Personal preference may also influence your size selection depending on whether you prefer a looser or a closer fit. For Maternity patterns, select according to your measurements before pregnancy.